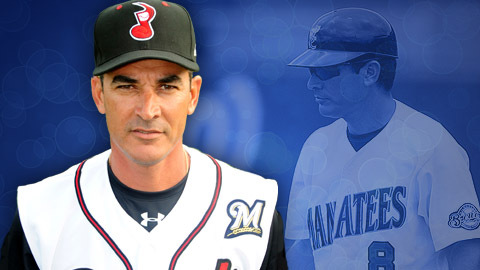 Coolbaugh honoree Mike Guerrero has managed at nearly every level in the Brewers organization. ST. PETERSBURG, Fla. -- Minor League Baseball™ announced today that it has selected Mike Guerrero, who managed the Nashville Sounds this season, as the winner of the sixth annual Mike Coolbaugh Award, presented to an individual who has shown an outstanding baseball work ethic, knowledge of the game and skill in mentoring young players on the field. The Coolbaugh Award will be presented during the Baseball Winter Meetings™ Banquet on Thursday, Dec. 12, at the Walt Disney World Swan & Dolphin Resort in Orlando, Fla.
Guerrero completed his 18th year as a MiLB™ manager this season and his 17th in the Milwaukee Brewers organization. His first job as a manager occurred in 1995, when he skippered Toronto's affiliate in the Dominican Summer League. The following year, Guerrero joined the Brewers organization as the camp director and manager of their club in the Dominican Summer League. In 2003, after seven seasons in the DSL, he served as the hitting coach with the Beloit Snappers in the Midwest League. Guerrero returned to managing in 2004 with Milwaukee's club in the Arizona League. After two seasons in the AZL, he steadily progressed through the Brewers farm system, with managerial stints in Class A® West Virginia (2006-07) in the South Atlantic League; Class A Advanced™ Brevard County (2008-09) in the Florida State League; and Double-A® Huntsville (2010-11) in the Southern League, before taking over in Triple-A® Nashville in 2012. Guerrero, who played nine seasons in the Milwaukee (1987-92, 1994-95) and Kansas City (1993) organizations as a middle infielder, was added to the Brewers' Major League staff as a coach in late September. He is currently managing the Licey team in the Dominican Baseball League. "Mike Guerrero has positively impacted the lives and development of many Milwaukee farmhands during his 17 years as a manager, which includes nearly every classification in their system," Pat O'Conner, President & CEO of Minor League Baseball, stated. "His tenure with the Brewers is a testament to Mike's work ethic and to the job that he has done in mentoring their players. The Brewers' recent promotion of him to the Major League staff speaks highly of how much they value Mike's coaching ability." "I am honored to be chosen as this year's Mike Coolbaugh Award winner," said Guerrero. "It is my passion to help develop young players as they strive to achieve their goals of reaching the Major Leagues. I want to thank the Brewers organization for their commitment to me and I thank Minor League Baseball for honoring me with this award." "On behalf of the Milwaukee Brewers, I congratulate Mike Guerrero as the recipient of the 2013 Mike Coolbaugh Award," said Brewers President of Baseball Operations - General Manager Doug Melvin. "Mike has been a loyal member of the Brewers family for nearly 30 years as a player, coach and manager. He is a consummate team player and has been accepting of any role that we have asked of him within our organization. Through his dedication and hard work, Mike has impacted the development of a number of Brewers players over the years, including Prince Fielder, Yovani Gallardo, Jonathan Lucroy and Rickie Weeks. He has touched the lives of many players and has been a key contributor to the success of the organization." Previous winners of the Mike Coolbaugh Award include Johnny Goryl (2012), Mike Jirschele (2011), Woody Huyke (2010), Charlie Montoyo (2009) and Bobby Jones (2008).